Hamburg based shipping company Hapag-Lloyd plans for 24 of the largest containerships in its fleet to get new bulbous bows by 2016, with some of the vessels also pegged to be fitted with optimized propellers, ultimately enabling lower fuel consumption coupled with fewer emissions. “It’s as high as a truck, weighs about 250 [metric tons] and is a prominent feature at the very tip of the bow of modern container ships. This has little to do with aesthetics and much more to do with fuel efficiency,” Hapag-Lloyd said. The shipper explained that the new bulbous bows displace water in a manner that minimizes or even completely eliminates a bow wave, generating lower water resistance on the hull. This means less fuel is required to travel at the same speed, and as a ship’s fuel consumption decreases, so too does its emissions. 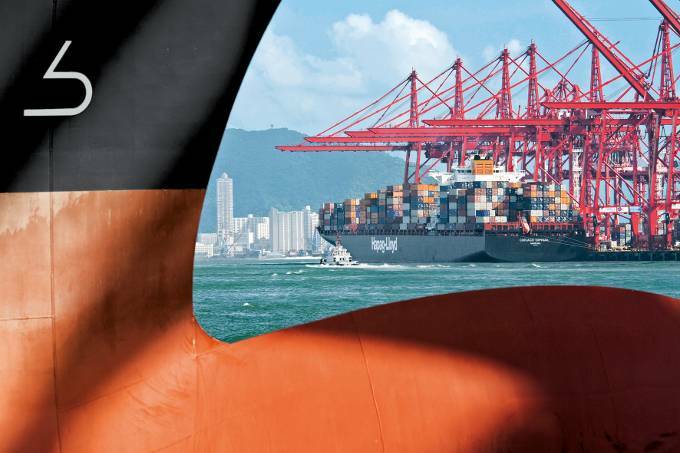 “For this reason, we continuously analyze how to make our ships even more efficient,” said Richard von Berlepsch, Hapag-Lloyd’s managing director for ship management. The bows of four of the shipper’s largest ship classes are or will be retrofitted at two shipyards in Shanghai over the coming year, as the 13,200 TEU containerships in the Hamburg Express class and the 8,750 TEU vessels in the Colombo Express, Prague Express and Vienna Express classes head into the docks one by one. “What might sound simple in theory is actually more complicated in practice. If the design of a bulbous bow is really going to save fuel, and thus reduce emissions, it needs to be optimized for the individual performance profile of a ship,” Hapag-Lloyd noted. The company said it has precisely calculated this profile for the 24 largest ships in its fleet, taking numerous factors into consideration along the way, including, for example, the ship’s area of operation and cruising speed. Also important is cargo volume, as it affects the ship’s draft. Hapag-Lloyd even identified further optimization potential for its most modern vessels, those in the Hamburg Express class, whose last ship entered service just a year ago. The original plans had called for the 13,200 TEU vessels to be smaller in size. “In addition, they were still optimized for an operating speed of 25 knots with a 15-meter draft,” said von Berlepsch. As a result of the subsequent introduction of slow steaming, however, the average cruising speed decreased to between 16 and 18 knots. Ships in the Hamburg Express class will also receive changes to their sterns, further improving propulsion efficiency with new propellers at the rear. “The new speed profile allows for further optimization of the propeller in terms of weight and efficiency, thereby increasing the overall effect,” von Berlepsch said. 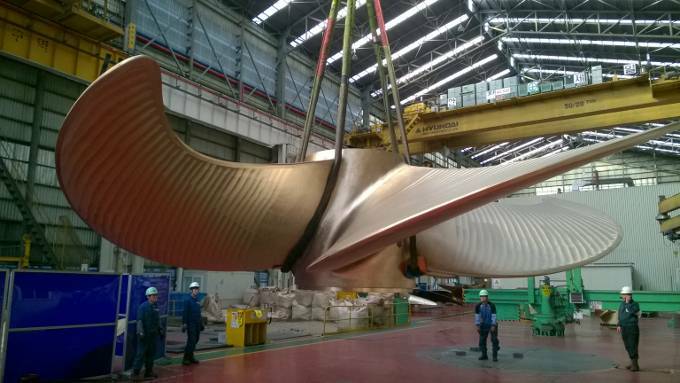 The new propellers are slightly larger than the existing ones (9.2 meters diameter, compared to 9 meters), yet about 11 metric tons lighter, now with five blades attached to the hub instead of just four. The optimization measures will lead to fuel savings of roughly 10 percent for the 13,200 TEU vessels alone, experts at Hapag-Lloyd anticipate. The shipping company asserted that it is therefore conceivable that these measures will be extended to other ship classes in the future.